A land beyond Swiss cheese and cable car, this country is vibrant and has a dime a dozen festivals around the clock. Every month has some event or the other to suit everyone’s taste. Here are a few of them. Grindelwald Snow Festival attracts artists and sculptors whose forte is ice sculptures from every country. During this annual event, sculptors and artists assemble in the village of Grindelwald. For six days, the town’s drab snowy streets transform into meticulously carved sculptures. This festival leaves memories for both tourists and artists every year. Imagine lovely balloons of all shapes and sizes against a bright blue winter sky. During this eight-day festival, visit the village of Chateau-d’Oex to witness 80 colorful hot-air balloons from 20 countries floating over the snow-capped mountains of the Alps. The Swiss most definitely know to add color to their dull winters. What happens when thoroughbred horses and jockeys across the globe come together to race on the frozen Lake of St Moritz? White Turf is one of a kind, where horses and jocks are both challenged to race on ice. There is big money to be won, so why not! Jockeys on unsaddled horses go up to a speed of 50 km/h. Is there a soul on earth who has not heard of the William Tell story? Well, if you haven’t; go read it up. This famous play was written by Schiller over 100 years ago. To commemorate this play, around 200 amateur actors of all age groups, including livestock (Yes, Livestock! ), and at times even foxes and squirrels perform on different stages in different venues for four months. Every other month, Switzerland hosts a music festival for genres ranging from Western Classical to Heavy Metal. These festivals are spread over a span of few days and are a great platform for upcoming musicians to showcase their talent. Colorful carnivals add color to the otherwise dreary winters in this country, also happens once in two or three months. Plan your travel to Switzerland around the festival you want to witness. 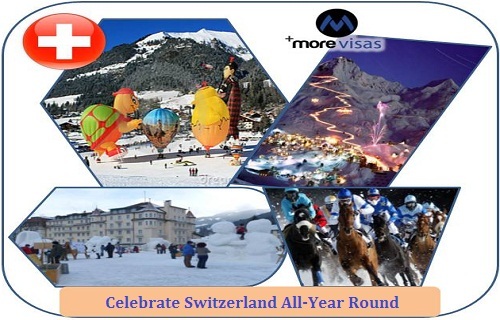 You need the Schengen Tourist Visa to visit Switzerland. For more information, please visit morevisas.com or drop into one of our centers and one of our consultants will guide you.